Is your front door damaged, weathered, waterlogged, peeling, outdated, or just plain old? If you answered yes to any of these questions and you live in metro New Orleans or Baton Rouge, we can help! We specialize in helping you find the PERFECT new door to replace your old worn out or damaged doors! You can shop online to see the styles and selection of doors we have on our website. Or you can drop by our showroom in Metairie where you’ll see a massive selection of custom doors as well as talk to our support team who can help you find what you’re looking for. Everyday life is hard on your front door. Harsh sunshine, driving rain, and regular aging can make your front door less than picture perfect. Why not replace your front door with a brand new replacement door? We have a wide selection of in-stock doors as well as any custom option you can imagine! Your fire or smoke-damaged door might be a candidate for refinishing, while a door that’s been structurally damaged may need a replacement. Either way, we can help you find just what you need. If you’ve been impacted by flooding, we’re here to help! Whether they’re so waterlogged you can’t open your door, the finish has been ruined, or your door is coming apart from the water, we can help secure your home with a beautiful, functional new door. 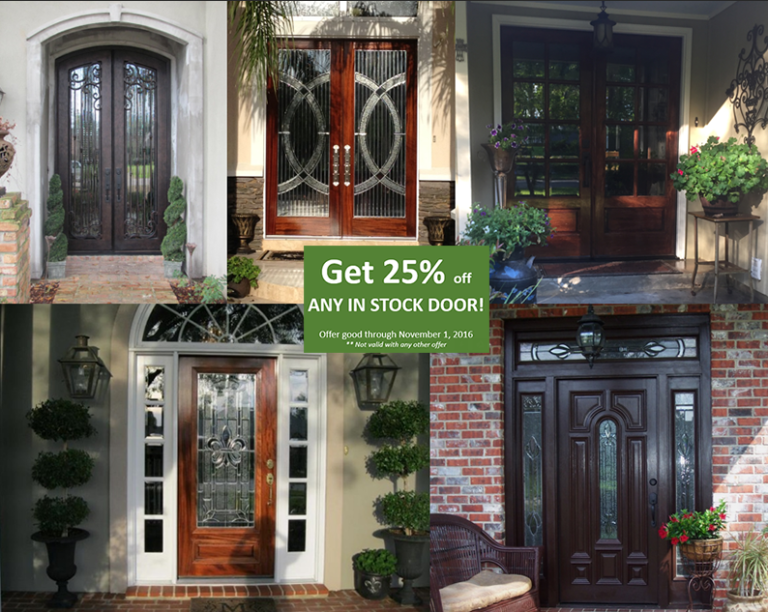 We will help you replace your worn-out, outdated, or damaged front door with a replacement from our large selection of in-stock doors. We also offer custom door options if you’re looking for something unique. Our experts may even be able to save your old door - our refinishing services might be just the face-lift your worn-out door needs! If you want to replace your front door, give us a call or request a free estimate online. Also, we sell all hardware necessary to replace a door! Shop online or come visit our newly renovated showroom located at 3100 Kingman Street in Metairie.